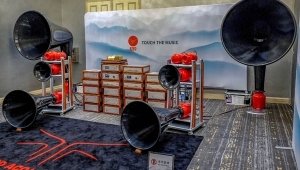 The last time I covered the New York Audio Show it was not, frankly, a great experience. The show was really small. It seemed like everyone was playing Diana Krall or some pop-classical piece from an audiophile label. Nobody, it seemed, dared to play interesting music. This year's experience was bettermuch better. The first room I walked intothe Audio Note UK roomwas playing an old cello LP; it sounded like Jacqueline du Pré, but I'm not sure. A good Audio Note UK system is a very fine way to listen to old classical LPs, among the finest. The next room I walked intothe Vitalis Audio room with its artful, idiosyncratic speaker/sculptureswas playing classic soul. In 2016 the poor acoustics of many rooms at the Park Lane Hotelbig, honking room modesintruded on exhibitors' attempts to achieve decent sound. The sound at the 2018 show was also better than it was two years ago. Every room I entered had something to recommend it. 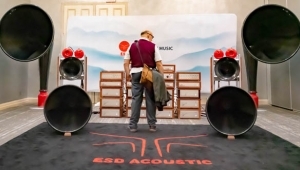 Although I didn't see much acoustical treatmentI only recall seeing panels in one room, the one sponsored by Distinctive Stereoexhibitors managed the hotel's acoustical challenges much more successfully this year. In the Audio Note room, those old classical records were played on an Audio Note TT3 turntable with Level-1 external power supply ($6445), mated with an Arm 3 tonearm ($1688) and IO 1 phono cartridge ($1443). The IO's low-output signal was raised by an S8 step-Up transformer ($10,958). CDs were played by the CD4.1x integrated (transport and DAC in a single box) CD player. The speakersAudio Note AN-E LX Signatures ($15,237/pair)were powered by the company's Meishu 300B-based integrated amplifier. 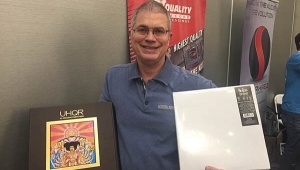 Cabling, of course, was also by Audio Note, including a set of bi-wire speaker cables that, at $12,639, cost almost as much as the speakersand considerably more than the $8264 integrated amplifier. The second time I entered the room, Bill Evans was onspecifically, the Bob Arnold-engineered Live at the Village Vanguard, from around 1967 or '68. That LP was followed by Side B of Vincent Bélanger's Láyou may have encountered Bélanger playing cello in Audio Note rooms at audio shows past. Side B of Lá includes music by André Gagnon and Giulio Caccini, recorded in churches around Montreal, so the recording itself is spacious and resonant, playing to Audio Note's strengths. On a later visit to the Audio Note UK room, rock musicsomething I didn't recognizewas playing via CD, impressively loud and without strain. A few minutes later, though, an amplified solo acoustic guitar was far larger than life. I prefer my images more life-size. Thinking I'd directly contrast Audio Note's old-school approach with something more modern, I wandered across the hall to the room featuring Magico loudspeakersthe relatively affordable A3 (affordable relative to other Magico speakers) and components from the German company AVM, including the $14,995 Ovation CS8.2 streaming CD receiver, which plays CDs, streams Qobuz, Tidal, and web radio, and even receives FM radio broadcasts. I've read it even has phono inputs, although there was a small phono preamp under the table. The 8.2 has a tubed preamp stage and can deliver 500W into 4 ohm speakerssuch as the $9800 Magicos. Cabling was Nordost, including their Valhalla 2 speaker cables. 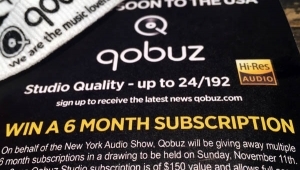 As I visited that room on Friday, AVM's Peder Bäckman's streaming attempts had apparently drawn the attention of (and a visit from) hotel management: Qobuz was, apparently, hogging the hotel's scarce bandwidth. No matter: just switch to AVM's lovely, simple Rotation R 5.3 turntable ($7500), which was world-premiering here at the New York Audio Show. The R 5.3 is elegant, its controls comprising just three small buttons (33rpm, 45rpm, power). The plinth is aluminum-wrapped high-density fiberboard; a 10" AVM tonearm and a dustcover are included. The platter lights up with a lovely blue light, which can be dimmed or switched off at will. Damped, height-adjustable feet allow easy leveling. The sound was what I expected: all there (except the lowest bass), organized, detailed but not hyperdetailed, with even frequency response and no glare or harshness, and laterally precise imaging with good depth. On the whole, the sound was unremarkable, in the best possible way. One of the most unusual and interesting products I heard at the show was by Sweden's Perfect8 Technologies: their Cube-S loudspeakers. The Cubes' cubes are formed from heavy, thick glass with opposed woofers mounted on each side and a tweeter suspended on the front. According to proprietor Jonas Räntilä, these glass enclosures, which stand atop integral chromed square pipes, virtually eliminate cabinet vibrations. Driven by a VAC integrated amplifierpossibly an iteration of the phi 300 series, but I'm not sure which one it wasthe sound produced by the little Cubes was enormous, the soundstage tall and wide, if not especially rich or deep or visceral. The image I formed in my minda visual analog of what I was hearingwas of a cinema-sized image projected on gauze. It's a presentation some will love, although the price$20,000/pairseems high for what it is. Excellent sound was also heard in the room featuring baffle-less speakers from the Pure Audio Project (with turntables and phono preamplification from VPI and a Hattor integrated amplifier); the sound was notably transparent with good but not exaggerated texture on voices and instruments. Next, the Value Electronics room featuring GoldenEar's Triton Reference loudspeakers also sounded very good: The GoldenEars' powered bass modules make them easy to drive with very modest amplification, such as the Peachtree integrated amplifier employed at the show. One idiosyncrasy of the very tall GoldenEar speakers: As a guitar solo moved higher in pitch, the sound climbed noticeably higher in space. 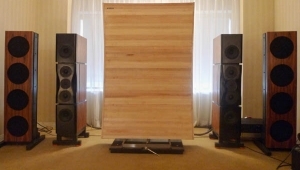 A room of particular merit was presented by Larry Borden's New Jersey-based Distinctive Stereo, featuring loudspeakers by Canadian company Muraudiothe $15,000/pair SP1and electronics by Merrill Audio: the Christine line stage ($12,400) and the Element 116 monoblocks ($22,000/pair). The digital source was the Wolf Alpha 3 server, ($7800), which sent its data out for conversion to an EMM Labs DAC 2x, presumably in version 2, which I'll soon be reviewing. The tall, stand-mounted SP1s are designed for wide dispersion, their curved front baffles hosting four woofers, two each mounted side by side in two sealed compartments, top and bottom. Between these compartments a curved electrostatic panelit curves horizontally and verticallyradiates sound above 750Hz to the front and the rear. Combined with dipole-style cancelation, the result is a carefully tailored radiation pattern, something closer to a point source than is achieved by most speakers that big (especially above the 750Hz crossover frequency). This thoughtful and innovative design yields an especially spacious (and otherwise faultless) sound, lacking only ultimate low bass; you just can't get that with four smallish woofers in sealed enclosures, but there were ample compensations: Imaging was precise and the soundstage was deep. The sound was neat and well-organized, with good pace. Two other notable rooms: At least one of my colleagues has written about the Robyatt Audio room featuring vintage Quad ESL electrostatic loudspeakers, professionally (and commercially) rebuilt by Electrostatic Solutions, on custom feet (which raises them up a few inches). Also in the system were a new Audible Illusions preamplifier (the Modulus 3B) and a pair of interesting monoblocks from Butler Audiodubbed Monadthat combine solid-state power and drive with the flavor of a 300B tube. Analog sources were new and old versions of Technics SP-10 turntablesthe new SP-10R (the R is for "reference") and a vintage SP-10 Mk II doing mono duty; both 'tables were equipped with cartridges from Miyajima Laboratorythe Zero for mono and the Madake for stereo. The 10R was mounted in a massive carbon-iron plinth from OMA, standing on a heavy turntable stand I lust after, from Brooklyn's Wax Rax. My colleagues will provide the details; I'll merely observe that the sound in this room wins the steel cage for bloody and visceralcharacteristics I especially value. 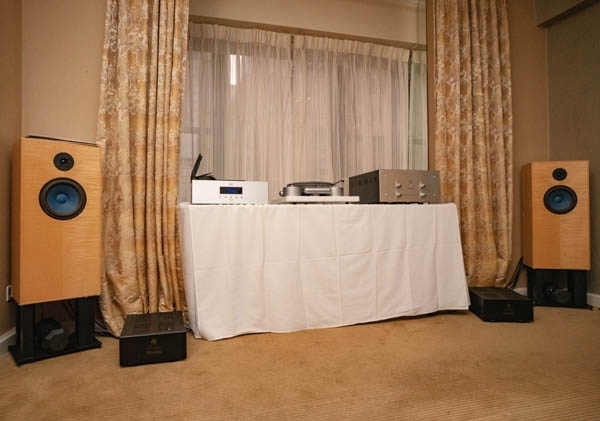 The Robyatt room was in a close contest for best in showwith the room from Sound By Singer, which featured Spendor's $10,000 D9 loudspeakers. Over the years I've come to realize, and accept, that classically tuned modern loudspeakers slightly miss the mark for me: I prefer careful tailoring on the high end, which is to say a bit more high-end roll-off than many designers choose. Driven by the gorgeous (if unwieldy) Absolare integrated amplifier, the D9s' presentation was just right for me. Their high-end tailoring yielded a sound that was exceptionally live, with less busy-ness on the high endless air, sure, but also less of whatever it is that makes music sound electronically produced, distracting from music's rich timbres. Doubtless the Chord and LauferTeknik digital front end components share credit for the exceptionally natural sound of this intimate system. She was Born in Where? , Brooklyn ? , She don't sound like it! She claims to be a NY'r but then again who would admit being from Brooklyn? Manhattan is a shopping mall.Brooklyn has real people. I came from Chicago to New York in 1974. I moved to Brooklyn in 1982 and while I am still alive I will stay in Bed Stuy - it is the only place I fit in and feel at home. Queens and the Bronx ain't bad either. 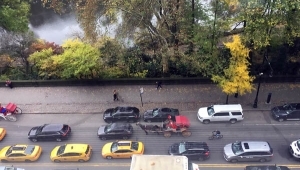 I have a bike - not a car. "...although the price—$20,000/pair—seems high for what it is". It's about time that reviewers and contributors called-out gouging where found, such as here. Wait till you see the $25,000 Turntable with a Rim Drive and read what the cure is for a flat spot developing. Hint: There is no cure for a Flat Spots developing on Rim Drives other than Waste Management's Land Fill. ps. the Reviewer even refers to "manufacturer Claims". Claims are not Science! ... a tube line stage - not output stage - and uses class D power amplifier modules from Pascal. I knew this, but sometimes when I'm writing fast my fingers get ahead of my brain. Whatever--your comment prompted me to request a correction, so thanks very much for that. Possibly--although an AVM component is Stereophile's cover this month. May need to space it out a bit.